Haaze is an AU plug-in for iOS (shown here running within Cubasis), which means you can run multiple instances of the app within the same project. Klevgränd Produktion will be well known to regular iOS music makers as they have a catalogue of iOS music apps available. These include both audio effects/processors and virtual instruments. Their latest offering — Haaze — falls into the first of these two groups as it is a tool for manipulating stereo width in an audio signal. Haaze offers two approaches to stereo processing. One is based upon the Haas effect (a short delay is applied to the left and right channels to create a stereo image) while the other uses EQ (the sound is split by frequency with adjacent frequency bands then panned left/right to create a sense of stereo). Both approaches are fairly classic ‘stereo width’ effects and, in Haaze, both can be applied at the same time. In terms of the UI, the controls for these two processes are typical of Klevgränd’s approach; simple, intuitive and to the point. The three vertical sliders are used to control the ‘split EQ’ effect and, thankfully, you can apply this EQ splitting independently in the low-, mid- and high-frequency ranges. The rather unusually looking ‘spring’ control can be used to create the Haas (delay-based) stereo effect. Here, you simply tap on the spring and drag left/right to ‘widen’ the spring graphic that, in turn, widens the stereo effect. Usefully, the point from which you drag on the vertical range of the spring determines the frequency at which the effect is applied so, again, you can choose to widen the high-, mid- or low-frequency ranges as suits your purpose. And, aside from repeating that you can use both effects at the same time, and that the Mix controls lets you adjust the wet/dry balance of the app’s output, then that’s about it in terms of the controls. 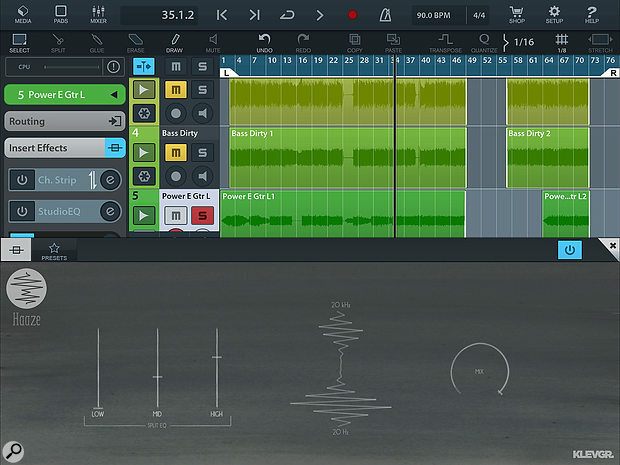 The other noteworthy feature is that Haaze — and all of the other Klevgränd Produktion iOS apps — supports the AU v3 plug-in format that is slowly gaining ground under iOS. 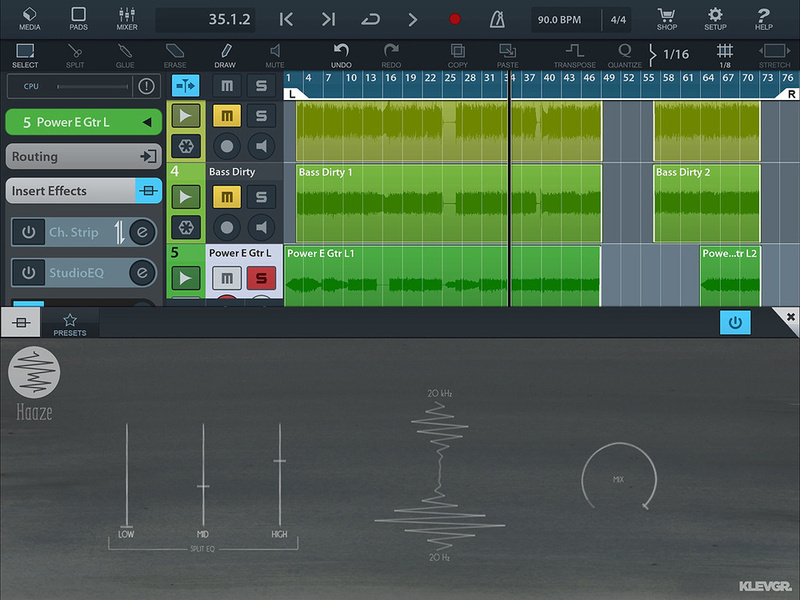 The app will work as a stand-alone processor but does not include Audiobus or IAA support. You do, therefore, need to be using a suitable AU host (Cubasis, AUM, Auria Pro, MultitrackStudio, for example) and, while the lack of Audiobus and IAA (both established iOS technologies) might not suit some, Klevgränd are keen to push AU as many (myself included) see that as the obvious future for iOS music software. Does Haaze get the job done? Well, applied to a mono guitar part, applying a bit of mid and high Split EQ or Haas-based processing really did open up the guitar part and give a sense of a stereo recording. Applied to an existing stereo sound source — such as my stereo drum kit — Haaze did, if anything, an even better job. Again, the options for frequency selective processing are extremely useful if you want to keep your kick drum fully centre while giving the rest of the kit just a bit more of a stereo spread although, like any stereo enhancement processing, it is also possible to overcook things it you are not careful. The simple, intuitive, control set is a pleasure to use. It’s amazing just how good an audio effects app costing pocket money can sound. And, if you like the iOS version of Haaze (or any of Klevgränd Produktion’s other iOS apps), then there are desktop VST/AU plug-in versions available that are also very competitively priced. Haaze is simple to use, cheap as chips and gets the job done.